The Cardapult V2 is a new version of the Cardapult. 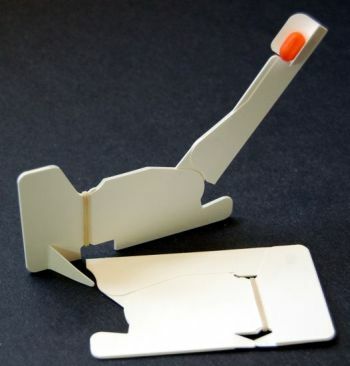 The Cardapult V2 is a rubber band powered desktop catapult that folds up into a standard sized 3.5" x 2" business card. It contains all the same features and a similar operation as the original Cardapult, but has been improved for greater strength, more power, and simplified construction. Watch the video below to see the card in action.